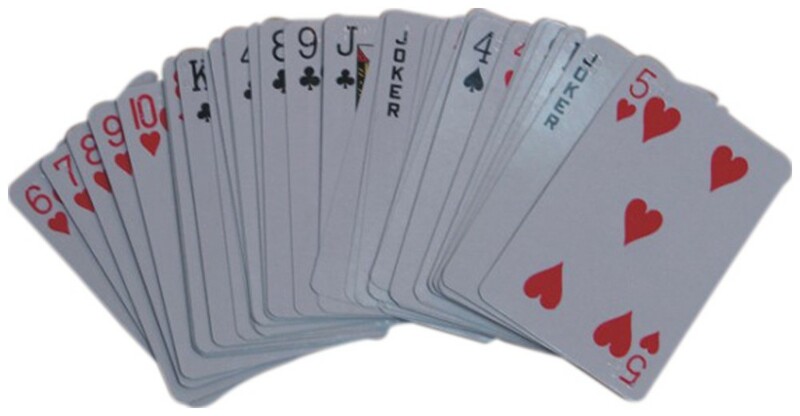 Deck includes 54 cardboard playing cards. Here's a regular print deck of playing cards (with Braille added), so blind and sighted players alike can enjoy a family card game. Yes - we've selected a standard deck just like what you'd find in local stores, so the cards are the same size, same colored suits, etc., as you'd expect - just with Braille on them. And because these thick, expensive-looking cards are laminated, if they get spilled on, all you need do is wipe them off with a damp cloth. Plus, the cards themselves come in a sturdy plastic box which actually snaps closed ... No more trying to make a crushed cardboard box hold your cards - again! For anyone who enjoys games (most of us love them, right)?, you can't go wrong with this deck of cards!